The Mole Patrol was founded in 1983 by Kelli Larsen. For many years it was the only pest control company in the Pacific Northwest dedicated to exterminating just moles and Kelli became the best mole exterminator in the business receiving both local and national recognition. The ownership changed in 2003, but the focus remained unchanged - do one thing, moles and be the best in the business of exterminating them. Since then, through extensive research and careful analysis of what works and what doesn't work, we have taken mole extermination to its highest level. We understand that a quick response is critical and we typically do the initial equipment set-up on your property within two business days from the day you place your order. No appointment is necessary as we do not require that anyone be home. On this initial equipment set-up, we thoroughly walk and search your property for all signs of mole activity. We place our equipment around the most recent activity and then level all old activity. We protect the equipment with hard plastic covers which are secured in place with 6" metal stakes. On each subsequent visit, we thoroughly search your property again for any signs of new mole activity and set and/or adjust equipment accordingly. When we catch a mole, we bury it where we caught it and denote the spot with a bright colored irrigation flag. The mole will completely decompose in four to twelve weeks, depending on the weather and soil conditions. When we determine that your mole problem has been eliminated, we pull our equipment and send you an invoice. This invoice date is the start of your 6 Month Limited Warranty and should not be confused with the date we started servicing your property. In other words, when the moles are gone, then your warranty starts. WARNING: DO NOT destroy or remove any of the mole activity. That’s how we read your yard to determine where to place our equipment. We will “level” any molehills in your yard each time we service your property. You may remove the leveled dirt to avoid bald spots in your lawn, but remember . . . DO NOT destroy or remove any new mole activity. Ground Moles Tearing Up Your Yard and Garden? 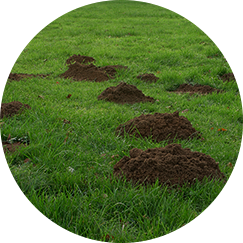 Mole Patrol technicians are experts at taking captive your lawn and garden moles. 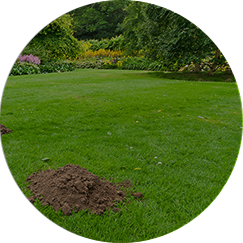 Contact us today to schedule a mole extermination visit in or near Seattle, WA. 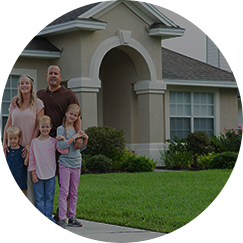 For more information on the areas we service, click here. Thank you for your always diligent service. They are a great company! I have no complaints with their mole extermination service. They are always careful about our gates so our dogs don't get loose. I have used these guys for about 8 year to eliminate moles on my property. I wouldn't use anyone else to get rid of my moles. Outstanding service and outstanding results. Staff was helpful, informative, and resolved our ground mole problem; where no other method or service was able to. Looking For Mole Control? Contact The Mole Patrol Today!